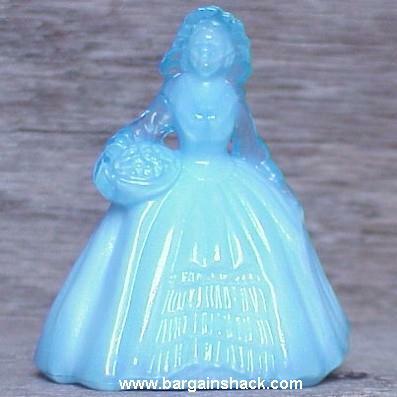 Elizabeth the Miniature Doll in Alpine Blue, Bargain Shack offers Boyd Glass, Mosser Glass, L.G. Wright, and Contemporary Collectible Glass including Vaseline Glass - J.B. Scottie Dogs, Pooche, Animal Covered Nests, Toothpick Holders, Salts, Glass Animal Figurines, Clowns, Dolls, Slippers, Vehicles, and More! Standing 2-1/4" tall with an basket under her arm is Elizabeth the Miniature Doll in Alpine Blue. From the retired series this is the 1998 annual collector's edition with a production date of March 9, 1998. The back hem of her skirt is marked with the Boyd trademark diamond B logo with 3 lines and the letter R.